20 boats were rigging in the boat park and rigging area. The wind was unusually lacking this evening , it was going to be a relaxed leisurely sail for a change. It was nice to see a full compliment of O.O.D. s so the race was going to be well supported. Everyone took to the water. The start line was very congested and Dave I decided he wanted to try get a good start so he sailed straight across the start blocking the sailors who were inching up towards the line. 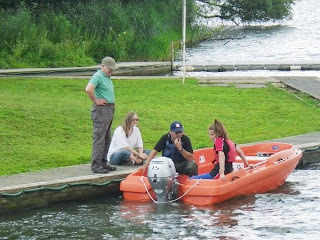 Unfortunately his boat stopped and poor Adrian tried to take avoiding action but clipped Dave s boat . Not a good start for Adrian. Dave seemed to continue from his perfect position on the start line and sail away from the fleet. The first mark was reached by Paul in his Europe closely followed by Ian and Mark. Ian crept ahead of Paul but he was concerned about whether he was far enough ahead or not. If Ian won then it would be very interesting in the Gillette leader board. The first 3 boats would have equal points with only one more race next Wednesday, but life isn't always that exciting and Paul beat Ian by 20 seconds. Another windy day…..Paul had only 1 OOD, so running a race for some 20+ boats was in doubt….where were the missing / no show OOd’s? 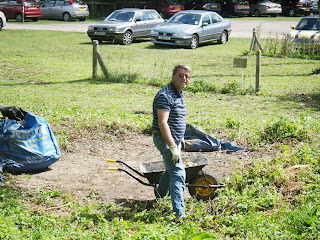 Fortunately Bob was co-opted / volunteered and the race was able to run. The course, 4p,9s,5p,2p,xs,8p,7p, gave some nice long beats and challenging runs. Young Ryan had a death role and a swim, but got his Byte up again and carried on. It was good to see young Andrew enjoying his first race in his Laser with David close by keeping an eye on him! Karen, just returned from the Miracle champs, exhausted, crewed Nev in his Ent and really enjoyed it – a big difference from her Laser. Chris was out in his new Solo with a huge grin on his face – safe to say he’s pleased with his new purchase!! 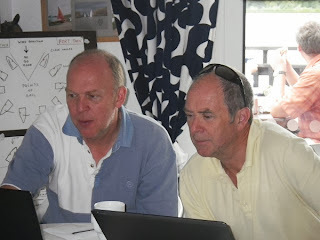 Dave, fresh back from the Fastnet, was heard to say how good it was to be in a small boat again and be able to come ashore so quickly at the end of the race – he made a good start and finished 3rd – well done Dave. 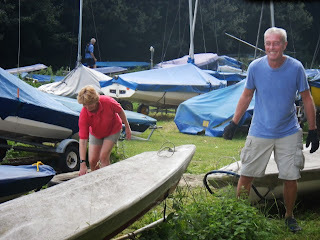 1st Ian in his Supanova, 2nd Roland, with a radial sail, also back from a summer of ‘big boat’ sailing. Perhaps we all need to do some big boat sailing to improve our skills?!! The Jolly Sailor must be off on his holidays, so there is little information about the race last week. All that I have gleaned is that it was windy, so windy in fact that some of the older folks retired just after the start. There are a few pictures though…. and the results show that Paul was 1st on handicap, Dave 2nd and Chris 3rd. A gentleman’s watch has been found in the gents changing room. Contact Monica for more information. 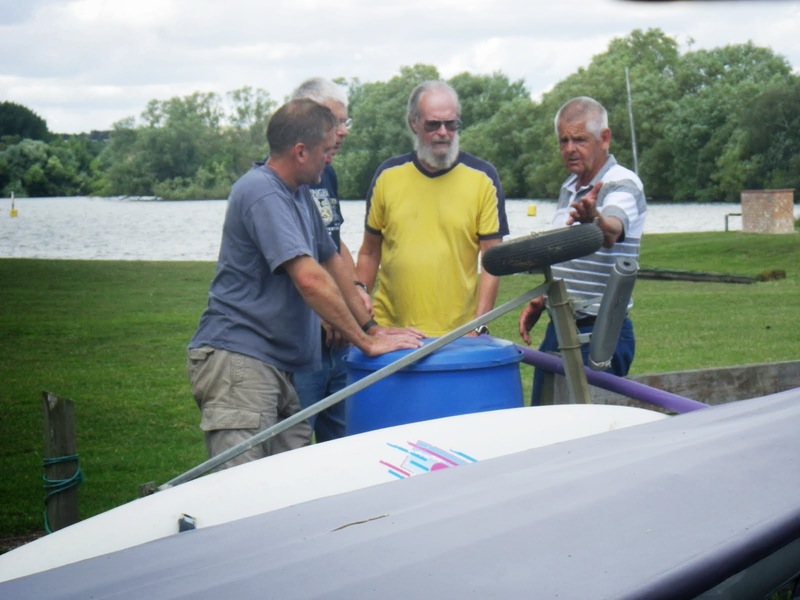 A different format for the August Pink Day – BBQ time – so no breakfast and after a comprehensive introduction to the racing rules by Ken, off we all went, all 24 of us from an Oppie, to a Feva – it was great to see so many new faces out on the lake. It was really good to see so many pirates making the " progression " up to Pink Fleet and giving us " oldies " a run for our money. With a bit of encouragement and coaching from Ken and Brian out on the water they sailed really well with David taking lots of pictures to prove it! The hour long race took in the whole of the lake except for buoys 7 and 1, a great course in a nice 6 – 10 miles an hour wind. 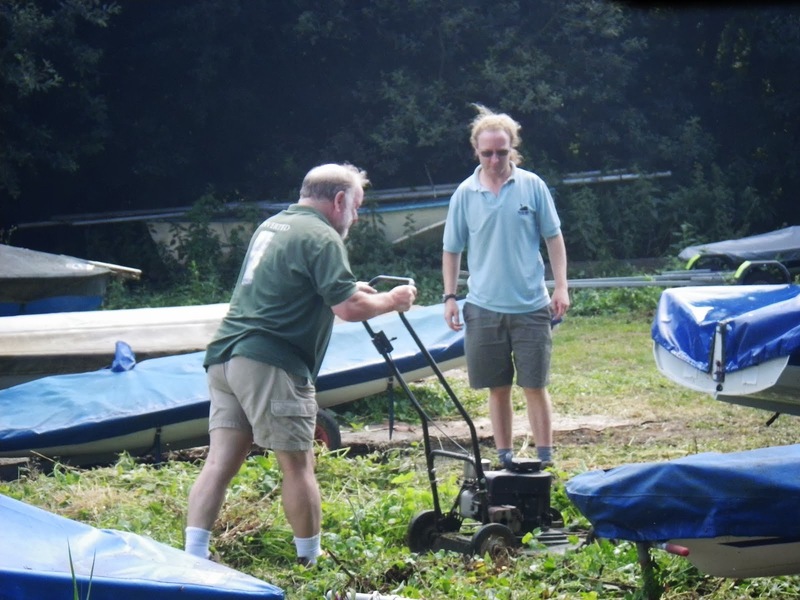 Although strenuously denied by Ken, it's rumoured that he was seen by Brian and Richard cuddling the new 15hp engine……..!!!! Nice one Ken. Monica decided to race with Dean in his " new " Laser 2 but they didn't even make the start line and had to be rescued when the mast became horizontal, needless to say they were both disqualified for making a mess of the lake. 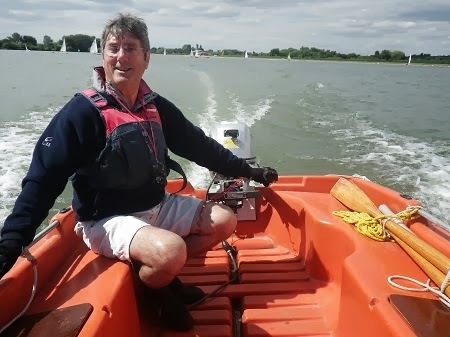 Commodore Jerry with crew Elaine hit the outer distance mark not once but twice and were immediately disqualified – like the Royal family perhaps only one of them should be on the water at any one time to be sure of succession! Pink Fleet is all about fun and learning and the quality of the sailing/racing is now up to a very high standard – look out Laser Louts on a Sunday morning, the Pinkies and Pirates will soon be competing with you! We saw the first spinnaker being flown by John, James and little Amber in their Lark. Never in the annuls of Pink Fleet have so many seen so few having such a great time in a boat. Flying a spinnaker with the boat half under water with Amber furiously baling out and all of them laughing with not a care in the world was a delight to see. The Pink Fleet cup was duly awarded to the three of them. But where was the cup? Gary won it last month but he was late to the party – on his way back from Cowes, don't you know!! Ken's wife Barbara came up with a great alternative with 3 plastic Pink cups which were presented to the three of them to the delight of the Pinkies on the deck. There was another spinnaker flying too, by Anna in a Feva, with her Dad – well done Anna. Meanwhile in the clubhouse the 2 Barbara's were hard at work preparing a gourmet lunch, with Pink Fleet chef, Paul, stoking up a massive BBQ outside. Everyone tucked in and by the time the Pirates took to the water, under the watchful eye of Carole and Gary, the table was bare!! The few that were there thoroughly enjoyed sailing around the island and capsizing of course. There were kayaks and surf boards, with Kate and Son deciding to paddle to the island as well, they managed a few feet and fell off – they just didn't seem to be able to paddle in unison!! Tane had another go in his Oppie from the beach while Affe went out in a kayak with Kate. People stayed on just enjoying the day and watching the youngsters messing about in the water – another lovely family day at RSC. there, have you attended any work parties yet this year? cleaned, lighting in clubhouse sorted out and lots of other jobs. 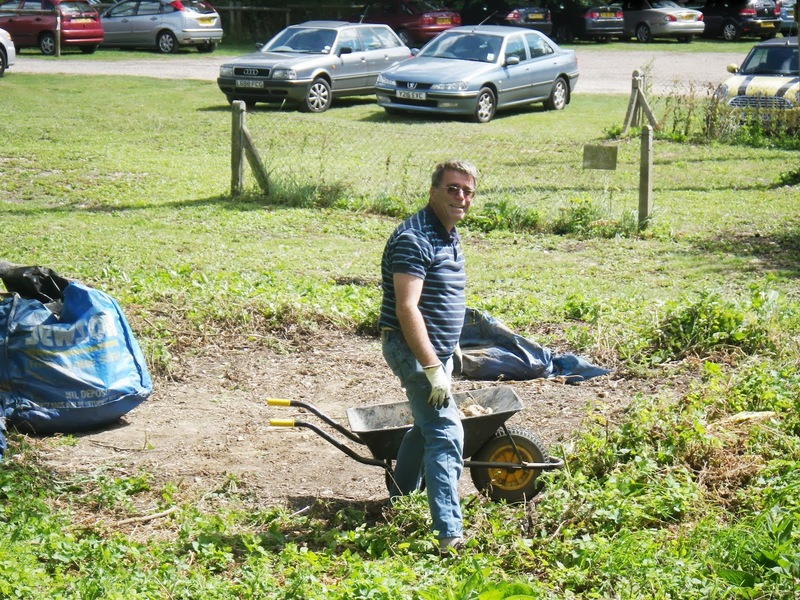 Thank you to everyone who attended and did their bit.